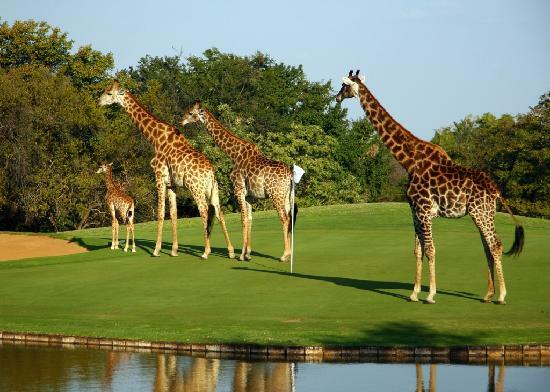 "A delightful nine-day Golf Safari to entertain the most discerning player with wonderful excursions for non-playing guests." What more could you wish for? 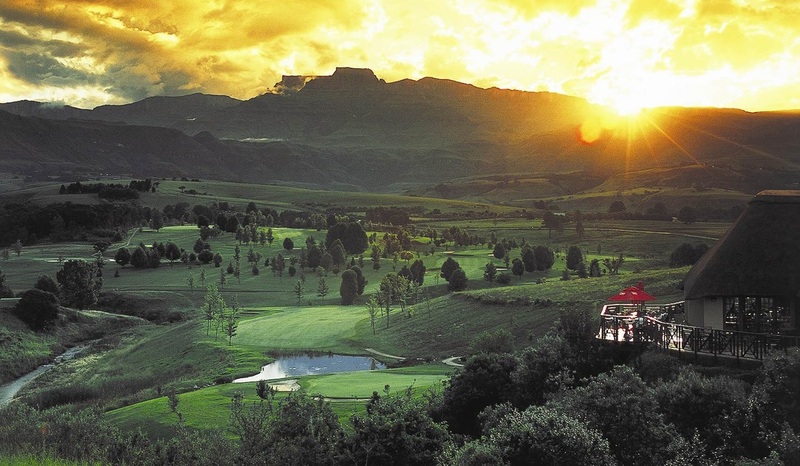 Rovos Rail has created a unique nine-day luxury rail journey catering both for Golfers and non-playing guests. 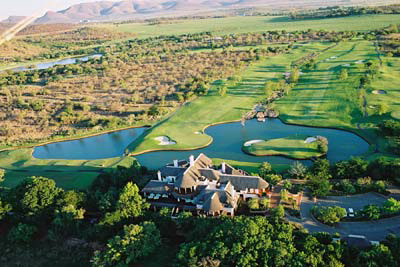 Rovos Rail is world renowned for its world-class luxury travel experiences. 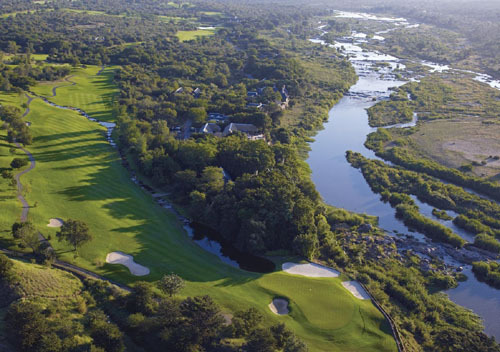 The Golf Safari covers the north-east of South Africa and will entertain the most discerning golfers on world-class golf courses. A special program has been created to entertain non-playing guests. Travel from Pretoria to Sun City* in the hills of the Pilanesberg for game viewing. Cross the spectacular Drakensberg Mountains to Spionkop*, the perfect base for exploring the mountains, bush, birds and battlefields of the region. 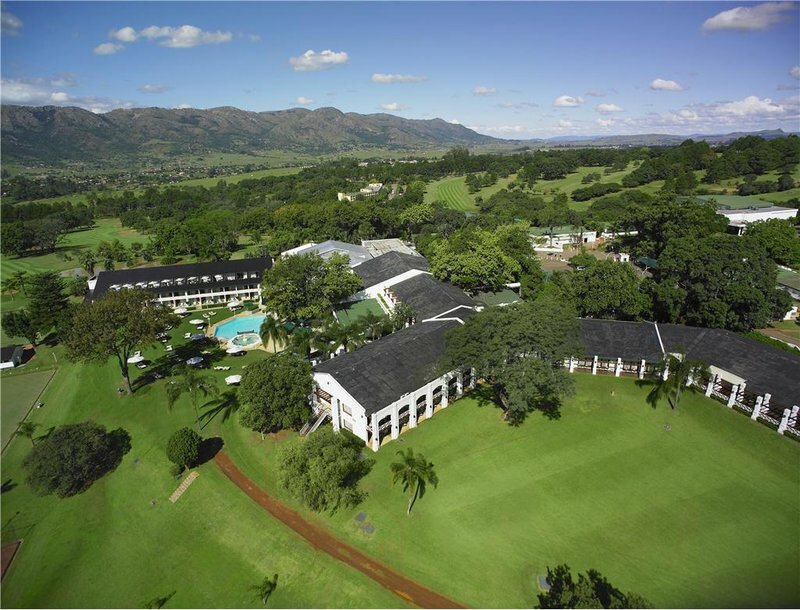 Traverse the scenic Valley of a Thousand Hills to Durban* for a tour of the city and botanical gardens. 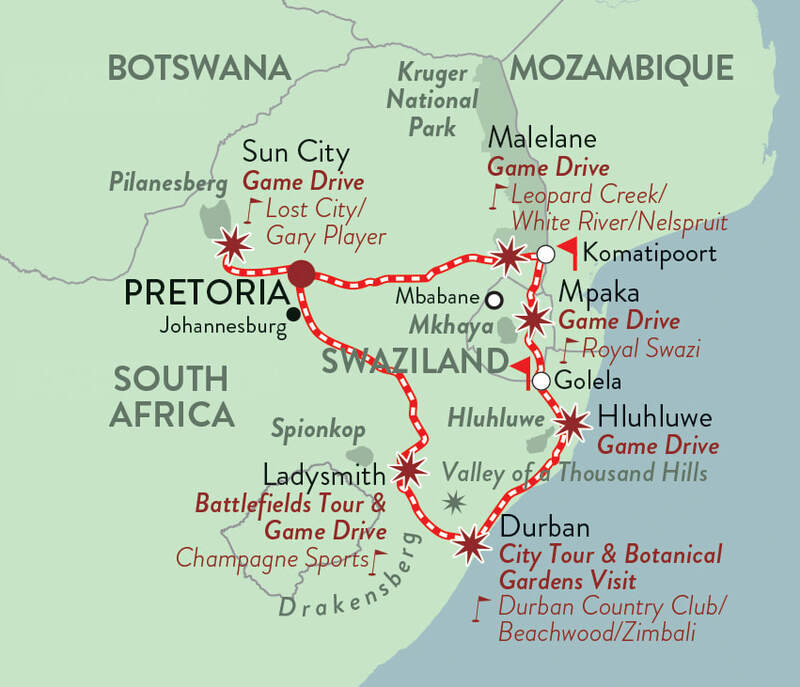 The game viewing continues at Hluhluwe in Zululand (one of the oldest reserves in the country), Mkhaya* (Swaziland’s refuge for endangered species) and the world-famous Kruger Park in Malelane*, after which this memorable journey ends in Pretoria. Accommodation, meals, all alcoholic and other beverages, 24-hour full room service and limited laundry while on board the train, as well as excursions accompanied by a qualified tour guide (where applicable) and government tax. Golf activities: green fees, carts, halfway house and beverages. 12:00 Depart Rovos Rail Station in Capital Park,Pretoria. Guests may freshen up in their suites before meeting fellow passengers in the lounge car or rear observation car. 16:30 Tea in the lounge and observation cars. 06:00 Breakfast is served until departure. 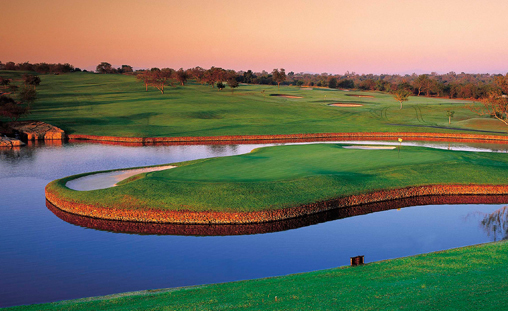 Transfer (60 minutes) to Sun City’s Gary Player/ Lost City Golf Course for tee off and lunch. Enjoy an afternoon of golfing and leisure. 17:30 Return to the train. 06:00 Breakfast is served in the dining cars until departure. Transfer (45 minutes) to Champagne Sports Resort for tee off and lunch. 17:00 Return to the train. 05:00 Breakfast is served until departure. Transfer to Durban Country Club/Durban Beachwood/Zimbali for tee off and lunch. 15:30 Return to the train. 16:00 The train departs Durban. 05:00 Continental breakfast is served until departure. 06:45 Board game vehicles for a game drive. 09:00 Tea break at Hilltop Camp. 10:30 Return to the train. 12:00 Lunch is served in the dining cars en route to Golela for border formalities with Swaziland. 16:30 Tea is served in the lounge car and observation car at the rear of the train. 06:00 Breakfast is served in the dining cars until departure. Transfer (90 minutes) to Royal Swazi Sun for tee off and lunch. 18:00 Depart for Komatipoort, South Africa. 06:00 Breakfast is served until departure. Transfer to Leopard Creek (15 minutes) OR White River Country Club (75 minutes) OR Nelspruit for tee off and lunch. 16:30 Tea in the lounge car and observation car. 07:00 Breakfast is served in the dining cars. 10:00 The train arrives at journey’s end at Rovos Rail Station in Pretoria. 12:00 Depart Rovos Rail Station in Capital Park, Pretoria. Guests may freshen up in their suites before meeting fellow passengers in the lounge car or rear observation car. 06:00 Breakfast is served until departure. 07:45 Transfer to Sun City. 09:00 Game drive in Pilanesberg Reserve. 12:00 Lunch with the golfers. 13:00 Afternoon at leisure at Lost City’s Sun City. 09:00 Transfer (60 minutes) to Spionkop Lodge for a battlefields tour and light refreshments before moving to Spionkop hill to finish this historic story. 13:00 Return to the lodge for lunch. 05:00 Breakfast is served until departure. 09:00 Disembark for a Durban city tour, a visit to the botanical gardens and lunch. 14:00 Afternoon at leisure OR return to the train. 07:00 Transfer to Mkhaya Reserve. 08:00 Board game vehicles for a game drive. 10:00 Transfer (75 minutes) to Swazi Candles. 12:15 Lunch and craft/curio shopping. 13:30 Transfer (15 minutes) to Royal Swazi to join the golfers OR return to the train (75 minutes). 08:00 Board game vehicles for a game drive in the Kruger National Park with a tea break en route. 13:00 Lunch with an opportunity for curio shopping. 14:30 Return to the train.